Have you always wanted to invest in the Canadian stock market, but had no idea where to start? You’ve come to the right place. In this article, I’ll show you everything you need to know about the basics of stock market investing. Not only will you learn how to get into stocks, but I’ll share some tips from an expert and let you know the type of account you need, so that you can get started today. Are you ready? Let’s dive in! The good news is that in 2018, you don’t need to visit a stock broker in person, call someone on the phone, or become engaged in a complicated transaction. In many cases, it’s possible to open a brokerage account and start investing with as little as $100. Look for a reputable account online, and then open your account. Once you do that, you will be able to start buying stocks. 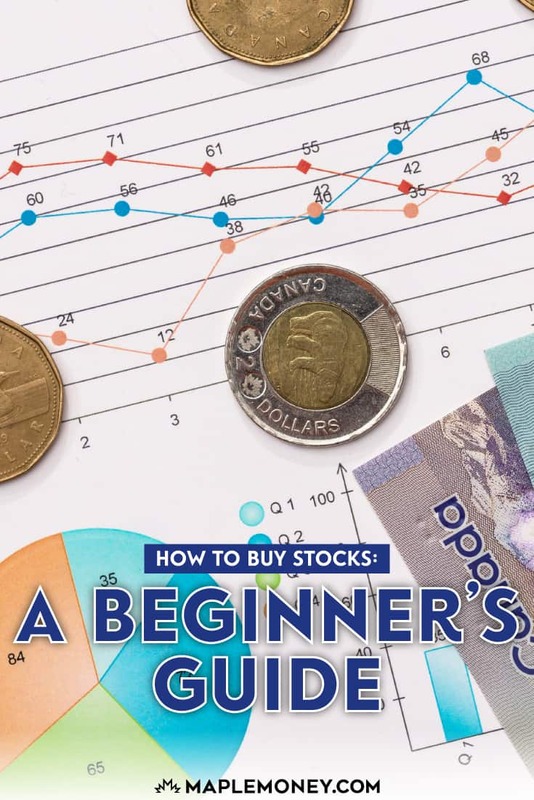 I’ve included more information on Questrade further down, along with an exclusive new account offer for MapleMoney readers, but first let’s take a closer look at what stock market investing is all about. The benefit to a novice investor is that you don’t have to try and learn how to buy stocks before you get started. A solid ETF, particularly one like XIU or XIC that tracks a wide market, can be a great way to get started. As I mentioned near the beginning of this article, Questrade is the online broker that I use personally, and I hold both a Tax-Free Savings Account (TFSA) and non-registered account with them. In short, I love Questrade for their low overall fees and ETF accessibility. As you’ll learn a bit later, one of the most important aspects of investing is to keep your costs in check. When buying stocks, high fees will diminish your returns over the long run. A single transaction may not seem that expensive, but over time, the fees will add up. Questrade allows you to buy stocks for as little as $4.95 per trade. Currently, it’s the lowest price you’ll find anywhere, with some of the competition charging as high as $9.99 per trade. Questrade actually waives the trading fee on ETF purchases, an offer only one other competitor (Virtual Brokers) can match. This alone make ETFs an attractive alternative to more traditional products, such as mutual funds. 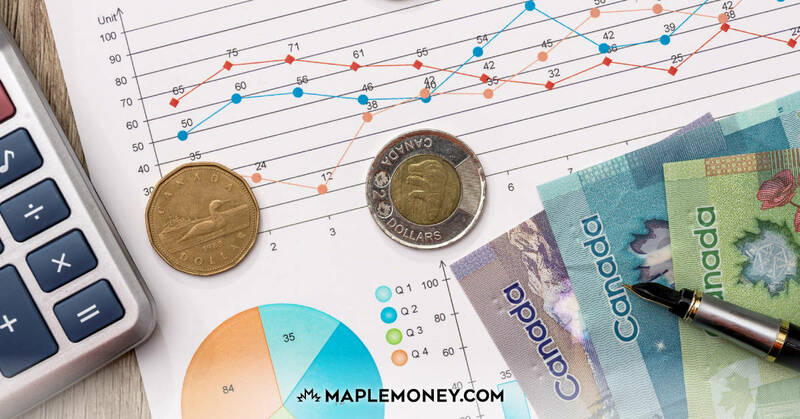 In addition to Questrades low cost advantage, MapleMoney readers can benefit by using my Questrade exclusive link, and earn $50 in free trades by signing up here. If you’re serious about buying stocks, it’s a great way to get started. As I mentioned previously, there are several other low-cost brokerages in Canada, including offerings from all of Canada’s Big Banks. Scotia iTrade is a good example of a discount brokerage offering from a major bank. Regardless of where you choose to open your account, as long as you have the necessary identification, and can provide your bank account information for transfers of money, it’s possible for you to get started trading stocks. A discount brokerage is the easiest way to start buying stocks. But it is a truly do-it-yourself option. The account holder is fully responsible for all of the decision making, as well as doing the necessary research. Of course, not everyone is interested in a self-directed approach, and for those folks, there are other options available. You can buy stocks through a full-service advisor. One advantage to this approach is being able to receive expert advice on your investments. As the investor, you will have the final say on any trades that are made, but you have someone you can consult with prior to placing trades. Not only that, but an Investment Advisor will possess the technical knowledge to manage the account administration on your behalf. The downside is that it is a more expensive way of doing things. Not only will you incur higher trading fees, but your advisor will expect compensation for the advice that they are providing. You will need to decide if the relationship and advice capability is worth the trade off of higher fees, but know that the option is available. Many banks and investment firms will employee teams of portfolio managers. These individuals cater to higher net worth clients, and often provide a broad range of additional services, such as tax & estate planning. Portfolio managers often act as discretionary managers. This means that while the investment objectives are established together, the client gives full control of the day-to-day investment decisions to the portfolio manager. While portfolio managers will still charge a fee for their services, by using the economies of scale, they can often reduce the cost for the investor. Similar to a full service investment advisor, they also bring a wealth of expertise, which can be of benefit. That said, if you lack the amount of investable assets to qualify, or you prefer to remain involved with the day to day decision making, a portfolio manager may not the best option for you. When you first get into buying and selling stocks, you may find yourself overwhelmed by the terminology. It is a new world you’re venturing into, after all. Common shares represent partial ownership in a corporation. In addition to earning shares of company profits, holders of common stock are given voting rights at shareholder meetings, where they have a voice in matters of corporate leadership and policy. Holders of preferred shares are the first to receive company earnings. For example, dividends are first paid out to preferred shareholders, and then to common shareholders. Preferred shareholders do not have voting rights, however. The bid price of a stock or ETF is the highest price that a prospective buyer is willing to pay, while the ask price is the lowest acceptable price for a prospective seller. Depending on how many shares are being offered at the bid or ask price, some of your order may be filled at a price other than the bid or ask. A market order is an order that is filled immediately at the current market price. The priority here is not the price itself, but the certainty that the shares will be purchased. It’s the most simple way to fill an order to buy or sell stock. A stop order is an agreement to buy or sell a stock when it reaches a specific price. When it does, it becomes a market order, and is filled. For example, if a stock in ABC company is currently trading at 5.00 per share, you may place a stop order to buy the stock when it reaches $4.75/share. This doesn’t mean that you will get the stock at $4.75/share, just that the market order will be triggered at $4.75. A limit order differs from a stop order in that the investor sets the minimum or maximum price that they are willing to buy or sell shares. Unlike stop orders, limit orders do not become market orders. This guarantees the investor that they will realize only their targeted price or better. Depending on the broker, there can be an additional cost to placing a limit order. Buying on margin is the practice of using funds borrowed from the investment firm, to invest. This is considered leveraging, as the client is investing money they currently don’t have. While margin trading can provide investors with the opportunity to multiply their returns, potential losses are also compounded, making margin trading a high risk activity. As such, margin trading is not suitable for the novice investor. Stock market investing can be intimidating for beginners. My hope is that this article has provided you with everything you need to get started, and helped you decide which online brokerage account will best meet your needs. In closing, I’d like to leave you with an additional resource. 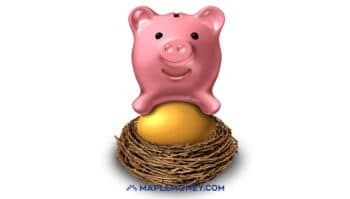 The following episode is from the MapleMoney Show, my weekly podcast. My guest is John Robertson, a personal finance blogger and author of the book, The Value Of Simple. John is a great resource for anyone who’s new to investing. In addition to our interview, John has a course specifically for investors, which you can access here. Click play to hear John’s advice on investing for beginners. If you don’t make enough to max out your 401k plan, do you still advice investing in stocks outside of your retirement accounts? My thought is that you wouldn’t want to do this. I am curious as to what others think. I noticed a lot of people also get confused with the many different trade options available – market, limit, stop, stop limit. Not to mention selling short. This is a great starting guide, though! I agree with Anton! I got easily confused when signing up through InvestorLine and got overwhelmed with the terminology. I initially selected “Trade Options” which messed me up at first but was later rectify. This is a good starting guide but make sure you understand the terminology when signing up and placing trades. Straight to the point, simple advice. Well written, Tom. I totally agree with your approach to go with ETFs. I myself invest in index funds directly through Vanguard, which is similar. Too many people try to get rich quickly by buying stock in small individual companies. They miss out on the potential benefits gained with a portfolio of stable, blue-chip companies with a history of modest and reliable long-term growth. Strive to balance out your stock portfolio by investing in both smaller companies with growth potential and major (large-cap) companies that are already established. These companies oftentimes have a stock price that is stable, meaning minimal risk. The risk is even lower when you buy a bundle of stocks in an ETF. Again, great read, thanks for posting! Nice article. One thing I would also suggest is before investing real funds, it is ideal to utilize a simulation tool to build a strategy in buying and selling stocks. You might be the type of person that wants to invest long term, or you might be interested in trading. If the latter, a simulation tool would be great to use. My tool of choice is Thinkorswim from TDameritrade. I am based in the U.S, and so I am not sure if that TDameritrade is available in Canada. But there should be an online brokerage company in Canada that provide simulation tools to assist you in your path to buying/selling stocks. Hi Judy, The margin account is basically the regular account, though you might want to choose TFSA or RRSP as well. Those three account types operate the same, other than the tax advantages. What is the impact of Capital Gain for Margin, TFSA and RRSP account types? I will be really greatful if you can explain each from tax perspective. It escapes me why Interactive Brokers is continually overlooked. They are American, but they do have a Canadian branch in Montreal. Their commissions are the lowest around. However, the minimum deposit may be difficult for some people. I am new and want to buy some shares in Canada.  I will be thankful if someone can advise me about some reliable online brokerage services.